High priest from about 79 to 40 B.C. ; eldest son of Alexander Jannæus and Alexandra. His mother, who had installed him in the office of high priest, named him as her successor to the throne. He had scarcely reigned three months when his younger brother, Aristobulus, rose in rebellion; whereupon Hyrcanus advanced against him at the head of his mercenaries and his Sadducean followers. Near Jericho the brothers met in battle; many of the soldiers of Hyrcanus went over to Aristobulus, and thereby gave the latter the victory. Hyrcanus took refuge in the citadel of Jerusalem; but the capture of the Temple by Aristobulus compelled Hyrcanus to surrender. A peace was then concluded, according to the terms of which Hyrcanus was to renounce the throne and the office of high priest (comp. Schürer, "Gesch." i. 291, note 2), but was to enjoy the revenues of the latter office. The struggle would have ended here but for Antipater. That astute Idumean saw clearly that it would be easier to reach the object of his ambition, the control of Judea, under the government of the weak Hyrcanus than under the warlike and energetic Aristobulus. He accordingly began to impress upon Hyrcanus' mind that Aristobulus was planning his death, finally persuading him to take refuge with Aretas, king of the Nabatæans. Aretas, bribed by Antipater, who also promised him the restitution of the Arabian towns taken by the Hasmoneans, readily espoused the cause of Hyrcanus and advanced toward Jerusalem with an army of fifty thousand. During the siege, which lasted several months, the adherents of Hyrcanus were guilty of two acts which greatly incensed the majority of the Jews: they stoned the pious Onias (see Onias ha-Me'aggel), and, instead of a lamb which the besieged had bought of the besiegers for the purpose of the paschal sacrifice, sent a pig. Onias, ordered to curse the besieged, prayed: "Lord of the universe, as the besieged and the besiegers both belong to Thy people, I beseech Thee not to answer the evil prayers of either." The pig incident is derived from rabbinical sources. According to Josephus, the besiegers kept the enormous price of one thousand drachmas they had asked for the lamb. Thus, between the weakness of Hyrcanus and the ambition of Aristobulus, Judea lost its independence. Aristobulus was taken to Rome a prisoner, and Hyrcanus was reappointed high priest, but without political authority. This, however, was restored to him by Julius Cæsar, who made him ethnarch (47); but Hyrcanus left all authority in the hands of Antipater, who used it for the promotionof the interests of his own house. 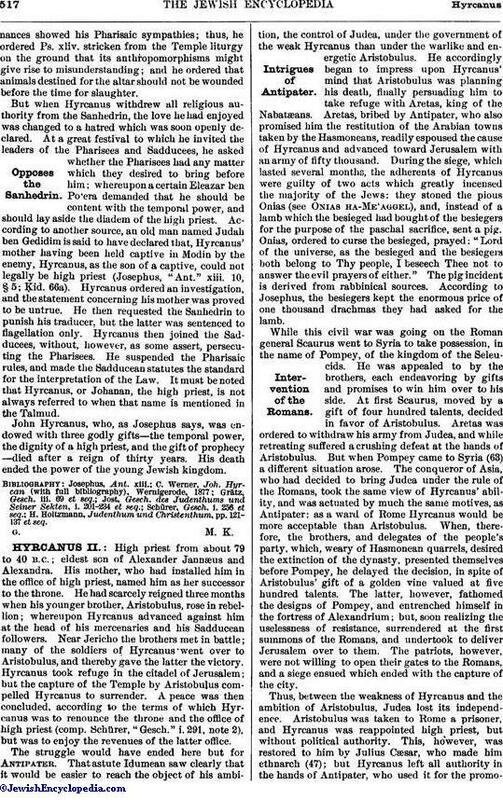 Indeed, Hyrcanus' incapacity and weakness were so manifest that, while he was defending Herod (whom he had previously saved from the hands of the Sanhedrin) before Mark Antony, the latter stripped him of his nominal political authority and of his title of ethnarch, and bestowed them upon the accused. 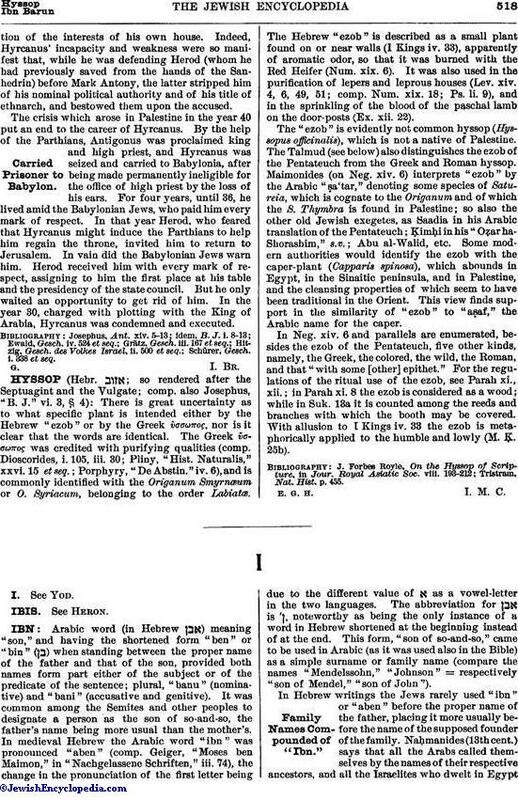 The crisis which arose in Palestine in the year 40 put an end to the career of Hyrcanus. By the help of the Parthians, Antigonus was proclaimed king and high priest, and Hyrcanus was seized and carried to Babylonia, after being made permanently ineligible for the office of high priest by the loss of his ears. For four years, until 36, he lived amid the Babylonian Jews, who paid him every mark of respect. In that year Herod, who feared that Hyrcanus might induce the Parthians to help him regain the throne, invited him to return to Jerusalem. In vain did the Babylonian Jews warn him. Herod received him with every mark of respect, assigning to him the first place at his table and the presidency of the state council. But he only waited an opportunity to get rid of him. In the year 30, charged with plotting with the King of Arabia, Hyrcanus was condemned and executed. Schürer, Gesch. i. 338 et seq.